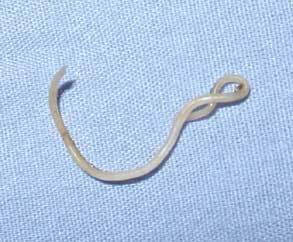 The two main kinds of roundworms affecting canines are Toxascaris leonina and Toxocara canis, sometimes refered to as 'ascarids'. Both worms have a round cross-section and hence the name. T. leonina adults are from 3 - 4 inches in length while the T. canis can grow to 7 inches. Although similar they have different life cycles. Once a dog has ingested T. leonina eggs, from contaminated soil or feces for example, they hatch and the lavae develop into mature adults in the walls and lumen (cavity where nutrients are absorbed) of the small intestine. Adult females produce eggs that are passed in the feces and the next cycle begins. On the other hand T. canis round worms have a more complex life cycle. They start off the same way by being ingested and making their way into the intestines. Once there they migrate into other tissues of the body where they encyst and can lay dormant sometimes for years. This usually occurs in older dogs. In other cases, as is often seen in puppies, the larvae move into the respiratory system where they are coughed up. The larvae then are swallowed back down into the intestines where they then develop as usual into adults. From this point the life cycle is the same, the females lay eggs and they are passed in the feces. The method T. canis roundworms use to encyst themselves in the muscle tissue makes them more resilient. A fetal puppy can be infected by T. canis larvae that make their way through the uterus and placenta resulting in in-utero transmission. There is, however, some controversy about this method of transmission. Alternately, after a puppy is born it can be infected through its mother's milk as the larvae can infect the mammary glands. This is why many puppies are infected at birth or soon thereafter. This is also why it is important to have puppies dewormed and to follow the schedule outlined by your veterinarian. Round worms in the intestines do damage and impede proper digestion while drawing nutrients away that are necessary for good health. As the infestation becomes more serious symptoms will begin to appear. Initially, as the larvae migrate through the respiratory system coughing will occur. At this stage there is the potential for pnuemonia to develop. 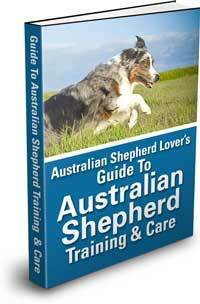 Eventually the dog will start to lose weight and their coat will lose its sheen. Their bellies can appear bloated and they will suffer from diarrhea or constipation. This may also be accompanied by vomiting and anemia. In more extreme cases the roundworms can cause an obstruction of the intestines. There are several medications available for deworming. To deal with roundworms they generally have to be taken more than once. This is because they only kill adult worms. After a period of a few weeks, once larvae that were in the system at the time of the first treatment have had time to become adults they can be killed by the second treatment. Your vet can advise you about the best treatment and schedule.